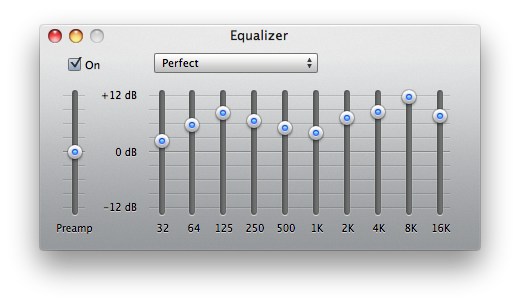 One thing I always do first on any new Mac OS X System, is setting up the following preset in iTunes Equalizer. May it be on the iMac at the office, my Black MacBook at home or the trusted old iBook, I found that those always sound the nicest. Are these settings suitable only for the internal squeakers or also for a real desktop sound system, like a 250W Logitech 2.1 f.e.? I guess you’ll have to try this out for yourself, since I only use the internal speakers or my iPhone headphones at the moment. Maybe they are only great for internal speakers. Sounds distorted on my Logitech system. But you can find tons of iTunes eq settings for rock/metal music and then there’s also self experimenting. Slide the Preamp slider two levels up with the “PErfect Bass” eq for “Perfect Bass AMP”. This is great for Drum & Bass Songs, but will only sound great if you have really good headphones like DJ Headphones.